JPX EZ 10.5 driver, JPX EZ 3 & 5 wood. Have you holed out with a Mizuno? Tell us where, how far, which iron you used - and if anyone saw it. Stoke on Trent or East Africa. Greenway Hall GC Stoke on Trent. MX700 Aldilla NVS 65S MX700 5 wood Aldilla NVS 85S MX700 26 ' Aldila Reg all Mizuno fitted. Hi Yes I had my 1st hole in 1 at Wolstanton golf club last September at the par 3 15th. The hole is 158yds off the yellow tee it is slightly down hill & down wind on that day. I used a 9 iron..... MP57s. May 7th 2007 at Darley Golf Course in Troon. 16th hole playing from the back tee 176yards, canned it with a Mizuno MP32 6-iron. My mate and regular playing partner Paul Bland was there to celebrate with me on the tee. Never did.. I do not have that type of Luck..
4 years ago, I was standing on the 18th hole of my home course which is a par 3 120 yard hole. My score is 76 at this point and I need a par to break 80 for the first time ever. The guys with me are winding me up something terrible on the tee and I managed to shank the ball straight right out of bounds! The guys are laughing so hard I think they are about to wet themselves. Anyway, with my head hanging in shame, I tee up my next ball and put it straight into the hole! OK so it's a hole in 3, but probably the best ever! Now it was my turn to laugh!! TM R1 8* V2 UST VTS SILVER 6S 45"
June 2009 MP 67 PW at Stanton Ridge G&CC 127 yards. One witness, hit it 5 yards pass the hole and sucked back into the hole. SWEET. Titleist 905R 9.5* V2 Stiff 44.5"
Wind Valley Private Course in the mountains of China, on the signature 177 yard 6th, it's basically just a tee box, a green and a bunker in the distance, and then ravine all around it. A cheeky 5 iron MP-32 to slot in the winning basket. I shot 68 that day, to date my best score by 6 whole shots! Frankly I love my irons a little too much. Oakhurst Country Club, Clayton, CA, 3rd hole, 165 yds, 6 iron MP30. Struck the ball well and as I saw it going a little right of the flag, I hoped it would catch the right bank of the green and kick left. It did and slam-dunked into the cup...unbelievable! Had my second hole in one June 23, 2010 at Laurel Valley Country Club at Townsend, Tennessee. It was an uphill Par 3 playing 140 yards. I used a Mizuno MX-17 7 iron, using a Bridgestone e6+ ball. Besides the other three guys I was playing with as witnesses, there were 2 wild turkeys on the back side of the green watching as well. I earned a hole-in-one using Mizuno Irons. I own a set of MP-60 irons. I used a 9-iron from 157 yards on hole #17 at River Club Golf Course in Myrtle Beach, SC. I have 3 witnesses that saw it. I was told that if I reported it to Mizuno I may be able to receive something in return. Is that true? Had my fifth HIO at Pinehurst #2 the 9th hole with a 5 iron. 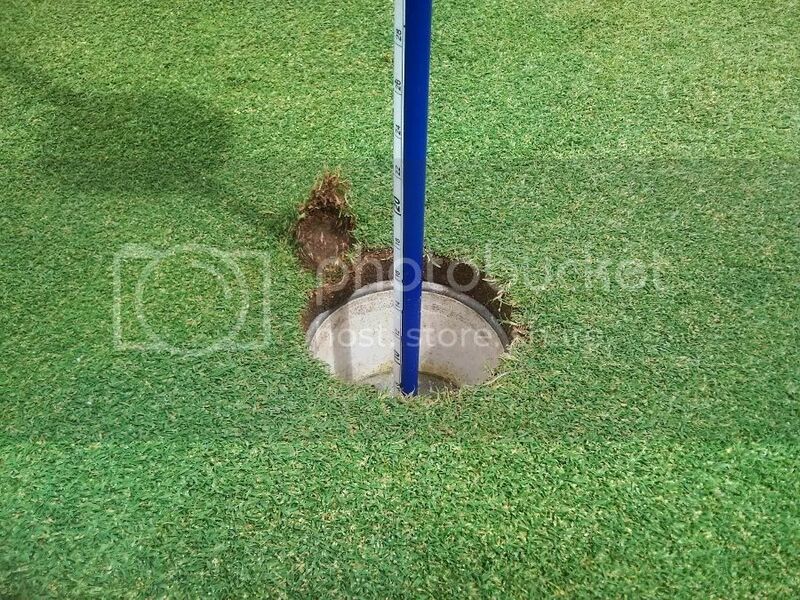 I went this close to a slam dunk yesterday with a pitching wedge, 135m, downwind. Ball spun back to about 2 feet. Have had one official (in comp) and one unofficial (social round) holes in one in the past. If that's the hole I think it is (from the club house out on the peninsular "back 8" with a completely blind green on top of a 30ft plateau)... then that's the most ludicrous shot I've ever heard of. Nefyn is a great course - featured on the Golf in Wales ad where they are bantering as the guy puts. It's like Pebble Beach where they serve bitter in the pub afterwards.. I've never had a hole in one. I have been very close though, stitched my fair share, but never holed. Closest was about 2 inches; broke my heart - 2nd hole at Dungannon 165 yds, 7 iron Mizuno T Zoid Comp. Had plenty of other close calls. Anyways, thought I would share my 'So Close But Yet So Far' story. Maybe some day I will be lucky enough I feel I deserve one. My father has had 4 holes in one, has kept all 4 balls and he played with Ryder Irons. Jammy So and So. Here's the 11th at Nefyn. I just looked it up and that's the 12th with the madly blind tee shot that shoots straight at the holiday traffic walking back from the pub on that path from behind the far hill? If I remember correctly there's a front 10 and two back 8s. The 1st hole on the peninsular (old) back 8 is a shorter downhill hole with a plateau green that's almost a vertical climb to get up to. Nefyn is one of the most spectacular courses out there if it's drives over sheer cliffs you're after.